Bleeding Hearts – With Valentine’s Day just around the corner and fun little projects needing to be made, this theme was selected with Valentines in mind; however, your project need NOT be a Valentine — whatever you need works. Our Bleeding Hearts challenges calls for us to use the color RED and a HEART in our project. That’s it!!! Oh, and I’m always open to a VERY liberal interpretation – LOL!!! Just have fun! Remember to use Mr. Linky below! Anyone is welcome and invited to play! SCS Keyword is ssnotime124 for those who upload at SCS. There is no time limit. You can play this challenge anytime at all. The point is to keep it simple, quick and have fun!!! Please link back here using Mr. Linky below. Jennifer Buck is taking the night off. Please bear with us all as we each upload and link on Thursday night. Everyone should be up and set by Friday morning. You may see all SCS Gallery Submissions here. As you can see, I kept it super simple — just some quick little projects suitable for treats and/or mass producing — super easy! 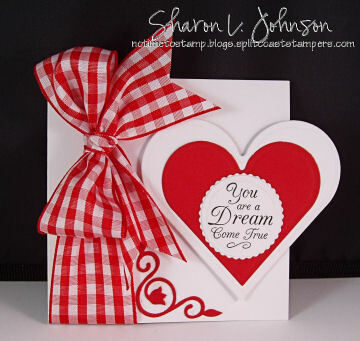 My inspiration for this project came from the cute sentiments in a set called Loving Thoughts by JustRite Stampers. I used three of the six sentiments contained in the set. And I could NOT resist putting some chocolate kisses into a bucket. I picked this bucket up from Wal-Mart. I added the white scrollies to it (a Cuttlebug die cut, run through the Xyron X to make them sticky-backed). It’s hard to tell with all the ribbon, but the sentiment is mounted onto layered hearts cut and embossed with my Heart Nestibilities by Spellbinders. The Gingham is 1.5” wide, by May Arts. I love making these little cello treat bags — great for school treats. Again, so simple — the top is just stapled onto the bag (under the red panel so you can’t see the staples). Again, a similar heart/sentiment/ribbon treatment – just using a different sentiment from Loving Thoughts. And lasty is my simple little Valentine card — fun! The card base is cut 4.25″ square. The heart is mounted on dimensionals and extends about 1″ beyond the card edge, making it the perfect size to fit into a standard A2 sized envelope. These would be super easy and quick to mass produce for school exchanges or even for your lady friends. Our group of friends used to have simple card swaps all the time, but we haven’t in years. Gosh, I miss those!!! This is a visual of Loving Thoughts. The 4 rounds sentiments fit the 1 5/8″ Round Wood Stamper, and they also fit into the 2″ Round Wood Stamper, as do all 1 5/8″ round stamps. There are 2 rectangular/square stamps in this set that are made to fit in the 2″ Square Stampers — LOVE those. All 6 stamps fit the 2″ Square Stampers. I’ve used them often already. Love this set. You can see a square sample here. JustRite Stampers carries the Loving Thoughts Set I’ve used today, along with the 1 5/8″ Round, 2″ Round and 2″ Square Stampers to use with it, along with their full line of product. The Stamp Simply Ribbon Store carries the 1.5″ May Arts Gingham Ribbon used on today’s project, as well as the Bow Easy, Petite Circle Nestabilities (4 pack) by Spellbinders, the Cuttlebug Vintage Die and VersaFine Onyx Black Ink. Tuesday, Feb 2 – The JustRite Garden Tour 2 Blog Hop – don’t miss it! Thank you so much for stopping in today! Hope you have a chance to get all your Valentine projects complete. Today’s challenge is a great opportunity to get you going!!! We’d love to have you play along with us and show us your new creation. 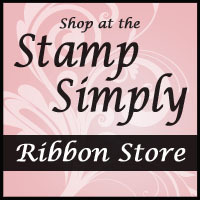 We hope that we’ve been able to inspire you to make some *Stamped Simply* creations. Please join in the fun and link to Mr. Linky below once your project is complete!!! Oh how fun, I love this challenge Sharon! I’ll try to do something this week, I’m still working on the Vintage design . . . LOL! Love your bag and bucket full of kisses . . . .perfect for Valentine’s! So crisp and pretty! Love the fresh country Valentiney feel! These are so darling, love them!!! Sharon I have been here every Friday since the first one. I always look forward to see what the challenge is but I haven’t been brave enough to submit anything yet. Thank you and your designers for a nice way to wrap up the week. These are so sweet Sharon!!! What totally “sweet” projects! LOVE this JustRite set and you’ve certainly used them in the BEST way ever! 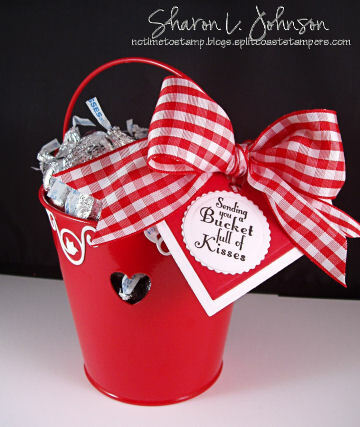 LOVE the “Bucket of Kisses” … very clever!! Thanks for a fun challenge … hope to get time over the weekend. so sweet and cute! Great projects. Love the red and white — so striking together!!! Just beautiful, Sharon! And your bows are dreamy!!! Such cute ideas, love the ribbon!! Oh, these are so cute, Sharon. I love every one of them. You keep teasing us by using that little corner punch from Cuttlebug that is no longer available, but if I had it, I would use it too. Very cute projects. I love the ribbon. I wish I dared to used large bows on my projects but I haven’t gotten to that place yet. I’ll keep working on it. Gorgeous samples, Sharon! Love that beautiful red gingham checked ribbon and your beautiful bows! Just too cute, Sharon!!! Love both of the treat ideas and that card is a great mass production project!!! oooOOoooo! Yummy and cute! Gotta love that! Oh my gosh, these are just THE sweetest! Gorgeous details as always, Sharon. LOVE everthing you do! Lovely inspiration! I just love your blog and can’t wait to see what’s up each week. Thanks! Just gotta say that I Love that red gingham ribbon! Beautiful work as usual. Oh My Sharon This is absolutely gorgeous! 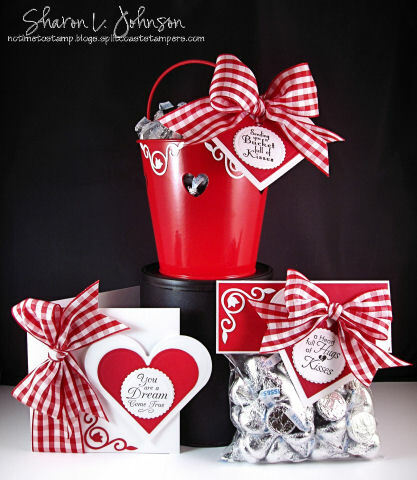 Love that bucket…want the kisses…the whole set is just Valentiny!! I played along. You can see my project <a href=”http://shestamps.blogspot.com/2010/02/your-friendship-warms-my-heart.html” on my blog. I don’t know how it gets better then that wonderful red and white! CUTE set. Inspiring as always! 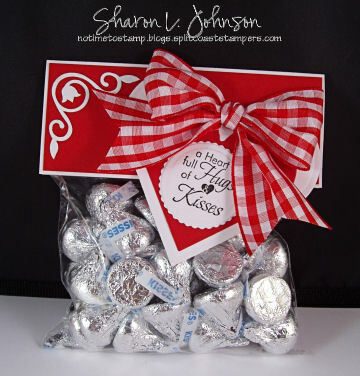 I’m trying my first small candy bag with topper (stamped & embellished, but a quickie lol), and I was wondering, there is no zipper on the top so I will fold the food baggie over a couple of times, then would I just staple in plain sight on the topper itself through the baggie? Thanks so much. What a fun Challenge! As you can see I did use the color red…and I have a Heart Charm hank=ging from the flowers! Thanks for letting me play along!